1. 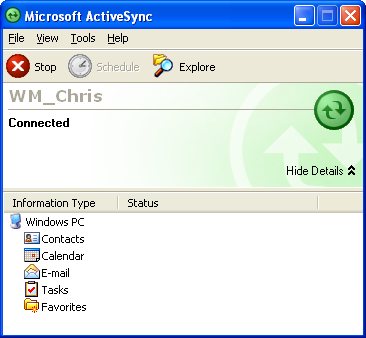 ActiveSync 3.x was released to support Pocket PCs, Smartphones, Palm-size PCs and Handheld PCs running Windows Mobile OS versions 2003SE and earlier with Windows 98, Windows ME, Windows NT, Windows 2000 and Windows XP. ActiveSync 3.x versions do not support Windows Mobile 5 and subsequent devices. 2. ActiveSync 4.x was released to add support for Windows Mobile 5.0 devices. It supports the desktop operating systems Windows 2000 and Windows XP. It also supports Windows Mobile 2003, Windows Mobile 2003 SE, Windows Mobile 5.0, Windows Mobile 6 and Windows Mobile 6.1 in both Pocket PC and Smartphone formfactors. Microsoft removed the ability to perform network synchronizations with ActiveSync 4.x due to Security concerns.